Exercise, like doing the hula, keeps us healthy and agile. Noble, smart, loyal and athletic -- that's the Doberman pinscher. However, like most purebred dogs, he's prone to certain hereditary diseases and conditions. To help avoid heartache and big vet bills, purchase your Dobie from a reputable breeder who guarantees the health of his puppies. A Dobie might carry the gene for this bleeding disorder without ever exhibiting symptoms, but if he's a breeding dog, he can pass it on to his offspring. The disorder is similar to hemophilia in humans. While affected Dobies may bleed a lot even from small cuts and scrapes, the real issue concerns surgical procedures. If uncontrolled bleeding arises, even relatively common surgery, such as a spay can prove fatal. Cardiomyopathy refers to any disease of the heart muscle. In Dobies, this often results in an enlarged heart. During the annual vet check-up, your vet should check your Dobie for any symptoms of heart disease. Signs of cardiomyopathy in Dobermans include coughing, weakness, lack of appetite and depression. Sometimes, there are no signs and the dog just drops dead. This disease sounds like the effect it produces, although the formal name is cervical vertebral instability. The Dobie might suffer from a malformation of the spinal canal, or instability of the cervical vertebrae. In the worst-case scenario, paralysis results, but not all dogs are that seriously affected. Some dogs experience weakness in the hind legs. Your vet can advise you on whether or not surgery is an option for your dog. Like many large dogs with deep chests, Dobies are subject to bloat, formally known as gastric dilatation volvulus. Bloat strikes very quickly, so a dog that seems fine can be at death's door an hour later. In this extremely painful condition, the stomach twists, cutting off the blood flow. Only emergency surgery can save your dog. If you're concerned about the possibility of bloat, your vet can perform a preventive surgery known as stomach tacking, which prevents the twisting. This disease, a lack of thyroid hormone, is commonly diagnosed in the Dobie. The good news is that treatment in the form of thyroid supplements is easily available and inexpensive. Signs of hypothyroidism include constant infections, hair loss, weight gain and lack of energy. Just because Dobies are prone to specific diseases, the situation is not all gloom and doom. Most Dobies live normal, healthy lifespans. 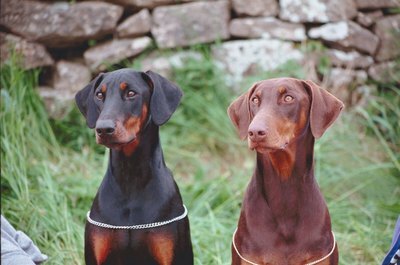 The Doberman Pinscher Club of America offers longevity certification for any registered Dobie who has lived to at least 10 years of age, or whose parents both lived to 10 or older. The DPCA's effort acknowledges owners and breeders whose dogs live a long lifespan, while also keeping track of the longevity bloodlines. When Is a Doberman Pinscher Full Grown?